Well, I had to meet this fabulous designer and thank goodness she so kindly agreed to a chat and a GIVEAWAY. Meet Yuliya! My designing path started during my teenage years in the pre-break-up Soviet Union. There was a shortage of nice garments, so creating your own was a way not to look like you had raided your grandma’s wardrobe. Sewing was a much-enjoyed school class taught by a talented instructor, who was capable of turning a potato sack into an evening dress. I also learned to knit from a text-book and with some help from my very patient grand-mother. Between myself, my mother and my grandmother we constantly had a few sewing or knitting projects going. Life changed, and for a while I thought that those skills were pretty much redundant, until recently life changed again and gave me a chance to wear my designing hat. When did you first learn to crochet and how did you learn? Crochet is a more recent passion of mine. Looking back at the time, when I was already confident with needles and a sewing machine, and was dabbing into other crafts, crochet, somehow, was the one thing I simply could not get. Its non-linear structure seemed beyond my comprehension and at that time I just gave up on it. A few years ago, when my daughter was still little, I came across a crochet bootie design. Those booties were perfectly formed tiny little shoes and were so incredibly cute that I could not resist giving a hook another go. I had this revelation moment and suddenly everything fell into place and all stitches made complete sense! The only problem I had this time was that I seemed to be completely incapable of following a pattern without ending up with something nowhere near the original. So creating my own designs seemed like a natural development. I have now moved away from baby crochet accessories to adult crochet accessories. I have published a few designs featuring slip-stitch crochet fused with regular crochet. My most recent infatuation is Tunisian crochet. Who knows where the upcoming year will take me! What influences your crochet style? I adore texture. Fabric is something that, for me, comes first, before I even decide what it is going to be. It has got to be something I love the look and the touch, so I can spend hours playing with my hook creating new stitch combinations to achieve a vision of fabric I have in mind. This is the reason I love making shawls – what could be a better way to showcase a special stitch pattern? Who are your favorite crochet designers? There are a lot of talented crochet designers I look up to and it is hard to only name a few. I am an admirer of Vashti Braha who, I think, is constantly at the forefront of crochet innovation. I am also very lucky to be designing partners with Lena Fedotova, with whom we co-run a group on Ravelry called “Cup of Stitches”. I believe Lena is one of the most gifted and inspiring crochet designers out there and her designs are always very vibrant, inventive and clever. Your patterns are fantastic, how did you learn to write crochet patterns? Thank you! Pattern-writing is a totally different kettle of fish to designing. I dedicate time to researching and analyzing the best practice, and try to learn from successful patterns written by established designers, both knit and crochet. Just like crocheting, pattern writing is a skill that gets better with practice and looking back at my earlier patterns I can see that I am much better at it now than when I was only starting. What do you consider the most important elements in a quality crochet pattern? There is a lot more to writing a quality crochet pattern beside following the standards and your style sheet, and making sure the front page lists the gauge and the materials used. In my opinion, a self-published crochet pattern (as opposed to patterns published in magazines, books, etc) leaves a lot more flexibility to the designer and it is up to him/her to use that wisely. If I were to name one important thing in a pattern, that would be being written with a specific audience in mind. When I write a pattern I try to be very clear from the start who I am writing it for and to be consistent with this choice throughout. Is it for someone who has never held a Tunisian hook, or is it someone who has used this technique for a while? Should I spell out some steps so that the crocheters learn as they go or should I assume this skill as given? How many visuals should I include? And so on. It is important to make it clear to yourself who you are targeting and to make it clear to your customers what your pattern is going to offer. Do you have any other words of wisdom for your fellow designers? I am not sure I am in a position to share any wisdom! :) Well, to those self-publishing designers who are only starting, I would say not to be afraid to “own” your designs. Go ahead with your vision and enjoy it. You may not please everyone, but there will be people who will share your taste and aesthetics, and those are who you are after. Thank you Yuliya for sharing your thoughts with us! Now for the GIVEAWAY: Leave a comment before midnight Sunday December 22, 2013 and let us know which of Yuliya's patterns you like best and 1 winner will be chosen by Random.org to win that pattern. Please make sure your comment has a way to contact you. If I cannot figure out how to contact you I cannot count your entry. Thank you!! Giveaway Closed, congrats to Truly Myrtle!!! Rusalka Cowl! I have admired that pattern for ages! Thank you for this post from such a talented designer! Inspiring! I love the La Mar hat. Beautiful. Thank you for such interesting questions and lovely compliments, Sarah! I greatly enjoyed this interview. I love her shawls, but I think my favorite is the La Mar hat. 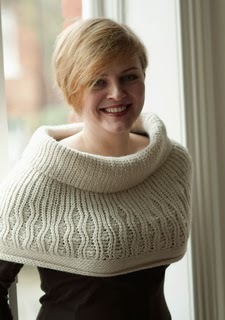 I just love her Rulsalka Cowl - I'd love to have a bash at it! Congrats Truly Myrtle!!!! You won!!! My favorite is the La Mar hat! Thanks for the giveaway! Love the la mar hat! It's amazing!